Along with cycling groups and other community partners, CHNA actively opposed the last minute switch by the city from the agreed to segregated bike lanes to painted Super Sharrows and on-sidewalk cycling during the 2 yr Holland Pedestrian Bridge detour. This resulted in a confusing and unsafe route for cyclists, pedestrians and motorists. Thanks to the leadership of CHNA in conjunction with other community partners, the city listened and implemented an improved detour featuring bike lanes. While the implemented solution isn't as robust as the original design, it is a vast improvement from the super-sharrows and on-sidewalk cycling. CHNA advocates for safer streets in our community and based on traffic speed and volume data provided by the City, Holland Avenue is a street at risk. CHNA attended the public meetings for the Harmer Pedestrian Bridge detour and was satisfied that the affected stretch on Holland, used by many school children, would be safely served by temporary segregated bike lanes. The City has now reversed its decision to create these temporary bike lanes Rather, based on a petition to preserve on street parking, the detour will now consist of less safe painted sharrows as well as on-sidewalk cycling on Holland Avenue. It is unclear what the process was for reversing the decision regarding this temporary measure. CHNA looks forward to re-visiting this decision with City officials and interested parties. 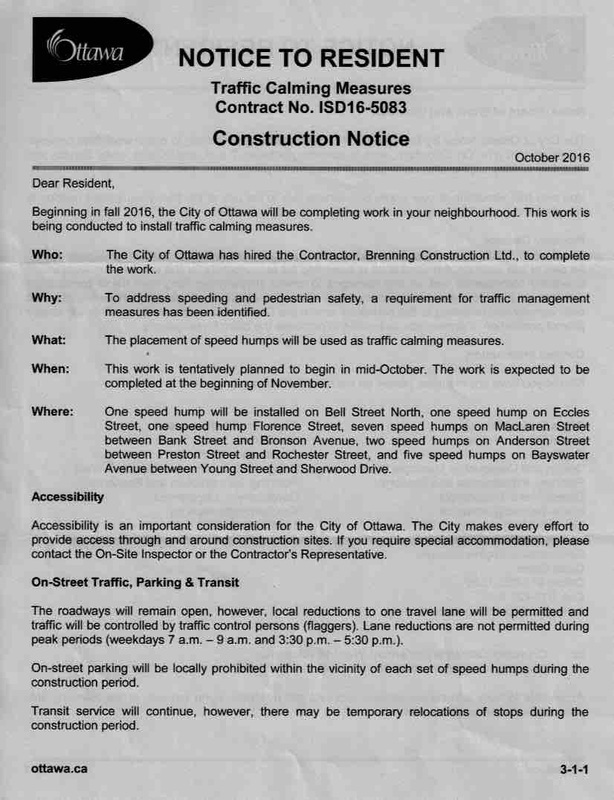 Contact Councillor Jeff Leiper to express your concerns and request that the temporary lanes be restored to Holland Avenue. On Tuesday Oct. 24, 2017, City Planning Committee supported the request for a Zoning By-law Amendment to permit a 'Parking Lot' as a permitted use for a temporary period of three years at 991 Carling (Carling and Fairmont) with potential future renewals of this temporary amendment. The city has approved the amendment. The requested ammendment was to allow hospital staff parking which wa not allowed under the current zoning. More details in an earlier article below. UPDATE: In the fall of 2017, the TOH replaced their shuttle buses with smaller, quiet and efficient buses but had to upgrade them to a slightly larger model. 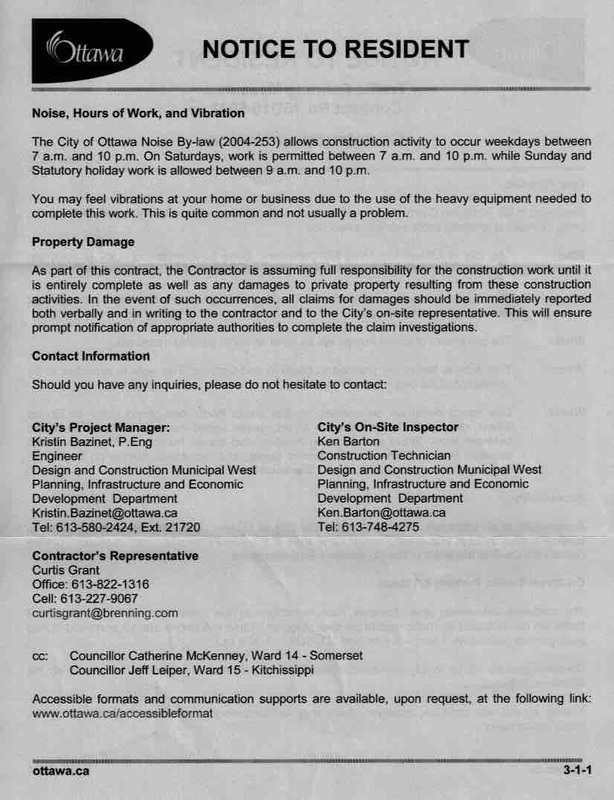 The worked with CHNA in the Spring of 2018 to minimize driving on residential streets and eliminate noisy backing up near homes. TOH successfully piloted a turnaround route within the Champagne parking which was made permanent upon the completion of some much needed pothole repairs in the lot. The CHNA and our residents are very pleased with this solution! 2017: The summer of 2017 was challenging for residents that live on Hickory and Bayswater, (and Sherwoord..and a few others!). The Ottawa Hospital (TOH) shuttle bus were not able to follow their normal route from the parking lot on Champagne to the campus due to the road work on Loretta avenue. This pushed the shuttles onto alternative residential streets. We all learned that summer open windows, noisy/squeaky buses and sleeping don't actually mix. CHNA and Councillor Leiper's office worked with TOH to explore all options to resolve this issue...and happily, a great solution has been implemented! TOH has purchased new, smaller, more efficient (and quieter) buses. Their new smaller size means they can turn around within the parking lot and return to Carling directly from Champagne! This is a great long term solution as it means they won't have to use residential Loretta street even after the road work is done. The new route also provides a safer pickup and drop off site for the passengers on the bus. Win Win! The Ontario Ministry of Transportation presented their recommendation to close the E-E Ramp (Carling/Westgate) to the City of Ottawa Transportation Committee on March 1, 2017. The CHNA was also their to ensure the councillors on the committee, many of whom do not live in the urban core, understand that such a closure will likely affect THEIR residents too...and that closure at this time premature. A holistic, area wide, transportation plan is needed so that the full impact on the area is known and the transportation needs of the new Civic Campus and the other major developments in the works (Westgate, redeveloped old Civic, and many many condominiums) are understood and planned for. In the end, this decision will ultimately be made in Queen’s Park, not at the City of Ottawa. It is critical that letters of concern be sent to the MTO - Kate Green and Lincoln Macdonald at Kate.Green1@ontario.ca and MacDonaldL@mmm.ca by March 1, and to our provincial MPP - Yasir Naqvi at ﻿ynaqvi.mpp@liberal.ola.org﻿. The expansion web site is at http://queenswayexpansioneast.com/home/. Despite the proposed mitigation, CHNA still has grave concerns about this proposal. You can read the letters we have sent to MPP Yasir Naqvi, Councillor Jeff Leiper, and Mayor Jim Watson. CHNA's encourages residents to also write letters to Mr. Naqvi, Mr. Leiper and Mr Watson, expressing your concerns. 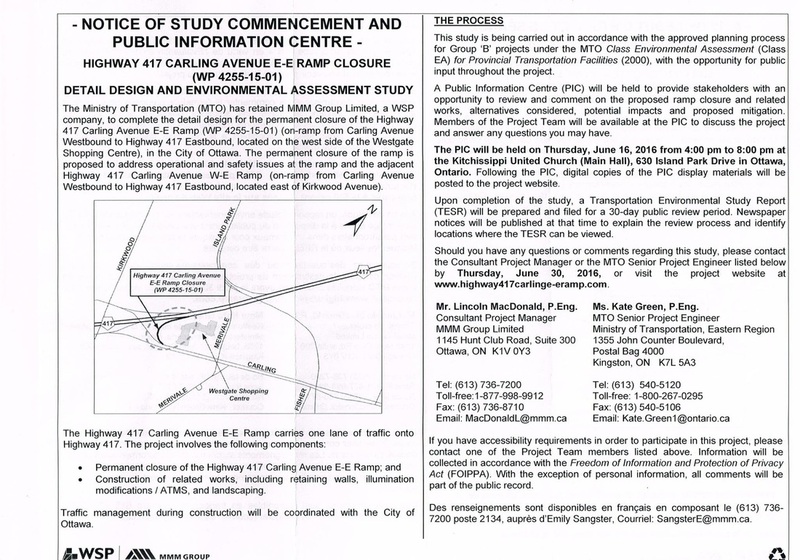 The CHNA was invited by the MTO to attend an information session on January 17, 2017, regarding an update on the design and environmental assessment study for the proposed permanent closure of the Highway 417 Carling Avenue E-E on-ramp. Proposed mitigation measures were presented, designed to address comments received throughout the public consultation process. Please note that this meeting was by invitation only with a second Public Information Centre planned for February 15, 2017 to update the general public. The CHNA opposes the closure of this ramp. 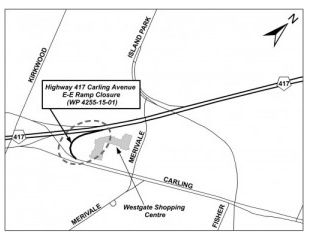 Closure of the 417 E-E ramp is premature in light of the intense development slated for Carling Avenue, including the new Civic Hospital, the old Civic Hospital site and the Westgate Redevelopment, and the lack of a transportation plan to address those developments. Closure at this time will have a negative impact on the neighbourhood resulting from cars being diverted onto Parkdale Avenue and nearby streets. This area is already highly stressed from traffic heading to the Queensway on ramps at Parkdale and will be worsened by the development of the new Civic campus. Details on the proposed mitigation and the invitation to the Feb. 15, 2017 Public Information Session found below. CHNA wrote the mayor to voice our collective concern regarding a plan to divert buses from Preston to Bayswater and Sherwood during the next phase of LRT construction. A copy of our letter can be found here. Councillor Leiper also voiced his concerns as per this ﻿Citizen Article﻿ and many of our residents wrote letters of concern. As a result of our concern, staff devoted additional time to review the proposal and has determined the replacement bus service should operate on Preston street. Staff is NOT recommending making any physical changes, nor to direct any regular bus operation to Bayswater Avenue or Sherwood Drive! A copy of the mayor's letter can be found Here. The good folks on Bayswater voted this year to reallocate some traffic calming money that was slated to put bulb outs on a Bayswater intersection. Instead of the bulb outs, the majority of affected residents approved using the funds to install traffic humps on Bayswater. The good news is...they are already starting to calm traffic!! Our thanks to the hard work of Liveable Bayswater, the City of Ottawa Traffic department, and our Councillor, Jeff Leiper, to make this happen. Please note, the study to get traffic calming on this street was done in 1997...so let's hope it doesn't take as long for us to get effective changes for our other vulnerable streets!! CHNA initiated a neighbourhood consultation process to identify support for our opposition to this proposed closure. 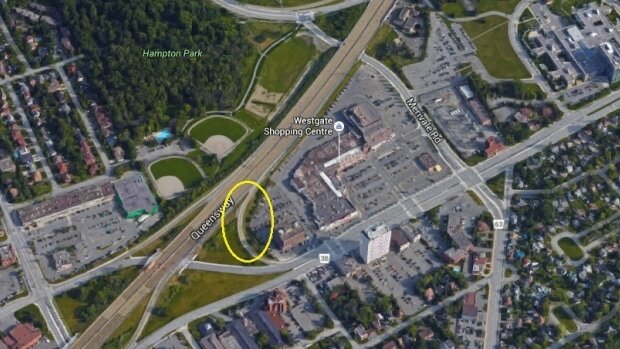 Removal of this exit is expected to have a serious impact on Parkdale traffic, as it will become one of the best remaining alternatives to get to the EB 417. For those traveling Westbound on Carling, their only other choice would be a convoluted path via the already congested Carling/Kirkwood intersection. We expect many drivers will choose Parkdale Avenue, a street that simply cannot handle any more traffic. CHNA is meeting with our MPP, Yasir Naqvi, along with Councillor Leiper on Tuesday June 14. A public consultation will be held JUNE 16th 4-8pm at Kitchissippi United Church. In addition, there is a petition created by a CHNA member and resident against the related widening of the 417 (the exit removal is tied to the widening project). For information and to sign the petition, click HERE. Late 2015, CHNA received notice of a request for a Zoning By-law Amendment to permit a 'Parking Lot' as a permitted use for a temporary period of three years at 991 Carling (Carling and Fairmont) with potential future renewals of this temporary amendment. The approval is to allow hospital staff parking which is not allowed under the current zoning. CHNA quickly reached out to residents to learn their concerns and shared those with our councillor. CHNA also printed additional copies of the amendment and dropped them off homes that would be affected, but were outside of the area officially notified by the city. CHNA and residents were able to provide comments by Dec. 24, 2015. CHNA's response HERE. *NEW* In January 2016, CHNA met with the planner, the proponent and our councillor. Based on CHNA and city planner input, the applicant has made changes to the lot layout as well as the entry and exit. Additional signage to reduce neighbourhood traffic is to be installed and the results evaluated to see if they do reduce the traffic concerns. The 2014 City of Ottawa Zoning Review, included zoning provisions for arterial main streets, such as Carling, intended to ‘humanize” the streets into more urban environments with “active, pedestrian- and transit-supportive street frontages”. The zoning along Carling Avenue generally allows for maximum building heights of up to 30 metres. Other provisions of the Zoning by-law stipulate that buildings must have active street frontages, including real, functional doors intended to work as primary entrances facing the street. This is done to ensure that the building interfaces well with the street and generally creates more of an urban main street environment like those seen on older urban streets like Bank and Wellington West. While we would hope that heights could be kept to the 11-20 metre range due to the need for setbacks from the existing housing, developers could still ask for 30 metres and the city has the option to allow.